An age-appropriate 20-minute DVD by Ben. Three are available; one each for elementary, middle, and high school aged students. Each has its own ancillary materials including background information on Benjamin Franklin, a guide to each DVD’s content, a series of questions for further discussion or testing, and an answer key to those questions. A live chat with your students and Ben over the Internet. By pre-arrangement, your students can interact with Ben in real time via SKYPE or similar program. 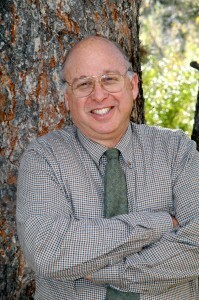 This twenty-minute Q&A is the program’s unique and defining feature. It personalizes the learning experience and brings history to life in a new and exciting way. After watching and discussing Ben's comments on the DVD, students can ask questions or chat with Ben in real time! A: Each professionally made DVD is geared to a specific age group and provides Ben’s personal take on his life and times, contributions, and ideas. On each DVD, Ben also promotes his most cherished values: hard work, the importance of reading, life-long curiosity, ethical conduct, working with others, service to community and nation, and patriotism. 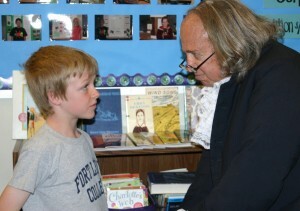 Also available is a fourth DVD: “Ben Franklin Speaks!,”® a series of fourteen short musings by Ben on a wide variety of subjects, including slavery, his relationships with other Founding Fathers, his diplomacy in France, and the kite experiment. The chapter headings help teachers or students access Ben’s ideas on specific issues and events quickly and easily. Q: Why use this program? A: Its educational impact is exciting and immediate, it requires minimal teacher preparation, it is very cost-effective, and it is appropriate at all levels of instruction from grades 3-12. It is truly the “field trip without the bus;” far less expensive or logistically complicated than, say, a trip to Williamsburg or an actual visit from a Benjamin Franklin presenter. Q: What does the program include and what does it cost? A: Normally, each DVD and its accompanying ancillary materials costs $25. For homeschool convention participants a special on-site discount is available of $20 for one DVD and a further discount of $15 for any additional DVDs purchased at that time. Purchasing one or more DVDs entitles teachers or Homeschool parents to their unlimited use and to schedule an unlimited number of live-time, interactive Q&A “sessions” via the Internet between Ben and their students. Each “session” is 20 minutes in length, costs $100--(special $50 rate for homeschool convention attendees,) and must be scheduled with Christopher Lowell in advance. There is no limit on the number of students attending one session. Fewer students per session gives a greater opportunity for individual questions, of course, but both small and large groups benefit from the interaction with Ben. There are discounts available for teachers scheduling more than one Q&A in a single school day. Write us for details. Q: How does the Q&A scheduling work? A: After making sure that you have SKYPE or similar interactive capability, contact us via email to set up a day and time for the twenty-minute session. Generally, arrangements and payment should be made at least two weeks in advance. 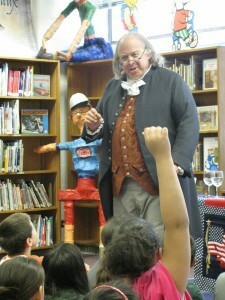 Q: Who portrays Ben Franklin? A: Ben is portrayed by internationally acclaimed historian/actor Christopher Lowell, who brings over 50 years of classroom and stage experience to his presentations. Chris has presented Franklin to audiences of all kinds coast to coast and in Europe on a full-time basis since 2004. 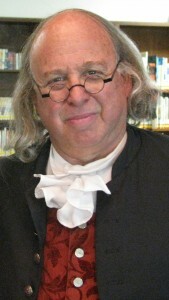 Pulitzer-Prize historian and Franklin biographer Gordon S. Wood has called him “…the best Ben Franklin I’ve ever seen.” Chris has presented in 35 states and abroad as well as for business groups, associations, non-profits, museums, libraries, and fund-raisers. He is comfortable and experienced in presenting both in English and in French. Q: And for more information…?